The first eight months of 2004 saw accumulated growth of 4.8% in relation to the same period last year. 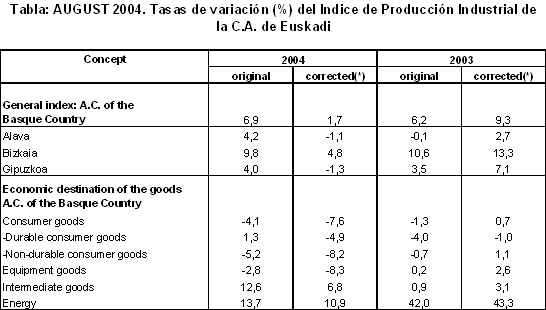 The inter-annual rate for industrial production in the A.C. of the Basque Country rose by 6.9% in August 2004, according to EUSTAT data. In homogenous terms, corrected for calendar effects, the inter-annual variation was 1.7%. Accumulated growth for the first eight months of the year came to 4.8% in absolute terms and 3.3% in homogenous terms. The most positive inter-annual variations, in absolute terms, for August 2004 corresponded to the sectors of "Electric material" (22.8%), "Electric energy, gas and water" (21.4%), "Timber industry" (17.2%), "Non-metal industry" (13.5%) and "Rubber and plastic" (12.8%). On the other hand, the sectors to undergo negative inter-annual rates were "Leather and footwear industry" (-42.5%), "Transport material" (-20.5%), "Food industry" (-13.6%), "Textiles and clothing" (-1.0%) and "Oil refining" (-0.1%). For the first eight months as a whole, compared to the same period of 2003, the highest accumulated growth rates corresponded to "Electric energy, gas and water" (23.9%), "Oil refining" (15.7%), "Electric material" (9.8%), "Rubber and plastic" (6.3%) and "Transport material" (4.7%). Negative rates only affected the sectors of "Leather and footwear industry" (-20.3%), "Metal and non-metal minerals" (-11.0%), "Non-metal industry" (-9.9%), "Other manufactured" (-6.6%) and "Food industry" (-0.7%). 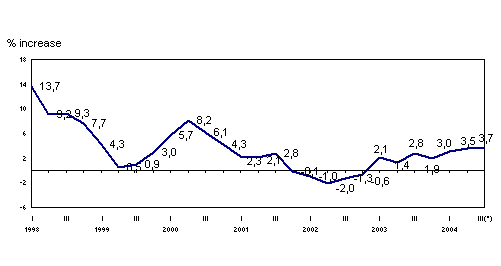 According to the classification of goods by economic destination, August 2004 saw the inter-annual rates rise for Energy (13.7%) and Intermediate Goods (12.6%), while Capital Goods fell by 2.8% and Consumer Goods did so by 4.1% due to the decrease experienced by Consumer Non-durable Goods (-5.2%), despite the growth for Consumer Durable Goods (1.3%). Discounting calendar effects, the inter-annual rate for Energy grew by 10.9% and Intermediate Goods also increased by 6.8%. Capital Goods, on the other hand, registered an 8.3% decrease, while Consumer Goods fell by 7.6%, with an 8.2% fall for Consumer Non-durable Goods and one of 4.9% for Consumer Durable Goods. For the first eight months of the year as a whole, the Energy branch accumulated 21.5% growth in absolute terms, 3.9% for Intermediate Goods while Capital Goods increased by 3.1% and Consumer Goods by 0.3%, where the share between Durable and Non-durable was –1.6% and 1.2% respectively. By province, inter-annual evolution of the General Index showed differing patterns, growing, in absolute terms by 9.8% in Bizkaia, 4.2% in Alava and 4.0% in Gipuzkoa. For the first eight months of 2004 as a whole, the highest accumulated growth rate corresponded to Alava with 8.5%; second came Bizkaia with 4.6% and lastly, Gipuzkoa obtained growth of 2.8%.